After three years of contributing travelogues to Sound RIDER! for readers' amusement, over the winter months we thought it was time to find out what this girl is all about. We've watched her grow from motorbike brat in pig tails to a full-fledged adventure rider. She's inspired many of those who read her columns. Enjoy. SR! Your first major trip was head first into a trip to Alaska. You learned a lot from that experience. What would you do differently if you were going to do the trip again? CF Actually, there is very little that I would change on that trip. More time would have been nice but as most of us know, time is not as infinite as we would like. One change would be to alter my choice and quantity of clothing. While I researched the weather, I was still surprised at how cool and damp the ride turned out to be. More warm layers and fewer clothes overall would have been better. The bike choice was perfect and while it would have been very nice to have waterproof side bags, I think that my soft saddlebags lined with garbage bags were sufficient. After all, other than purchasing the bike, I was essentially using whatever I had lying around the house. As I'm thinking about the trip I'm musing over some alterations that I might make, but nothing that is incredibly earthshaking. Because my time was limited and the plan was to reach the Arctic Ocean and back, there was very little time to check out any little interesting side routes. But as I think back on the trip, I can't recall riding down the road ever thinking: "Oh, I'd like to stop there! Too bad we don't have the time." No, it seemed that things worked out well. SR! Your moto travels have been through America and into Latin America. Any plans to do some riding off this continent? CF I have grand plans of riding around the world through both northern and southern hemispheres. Unfortunately, I don't yet have the means to make these plans a reality. My workplace is planning on sending me to the UK for a week one of these days, which I hope is soon. It would be one week in England for work hopefully followed by two weeks of vacation, as I have been promised the use of a friend's bike while I am there. The places that I really want to visit, in the order that I'd like to visit them, are South America, Africa, Eastern Europe and Central Asia. New Zealand is on the list, as is Australia, but not as high as the others. Personally, I think Helge Pedersen (Globeriders motorcycle tours) needs to hire me as an assistant. SR! Motel it or camp - what's the preference? Has that changed since you first started adventure touring? CF Honestly? I prefer a nice, cheap motel; the cheesier the better. I want the "Acme Motel" that has been sitting at the side of the road since the road first came through town back in the 50s. None of this hoity-toity Holiday Inn stuff for me. But even better than the Acme Motel is the ancient hotel tucked into the downtown area of a small town. The hotel would have been built when the town was and it would have a great history of prohibition raids, gunfights and historic fires. And the icing on this cake? Next door will be the same Mom and Pop diner that has been there since the motel was built, full of greasy food served by a matronly waitress. All that being said, I am striving to be a better camper. Even the cheesiest of motels cost money and I'd rather be putting that money back into my bike in the form of gas or tires. So this year I'm going to concentrate on making my camping experiences good ones so that I'm more likely to pull into a campground than a Motel 6 at the end of the day. But if it's raining, then forget it; the warm dry bed at the motel will win hands down. SR! Often referred to as the "Den Mother" you're an active contributor to the Sport-touring.net forum. How has your riding experience been improved by being a member there? CF STN, as it's called, has really opened up my eyes to what is out there in the motorcycling community. I read about other riders' trips and make notes if it looks like something I might enjoy doing some day. There are stories about riders who have crashed their bikes for various reasons and I pay attention to the causes and the possible preventatives that are posted, filing them away in my mind for reference in case I find myself in a similar situation. There is an abundance of information on gear, motorcycles and maintenance, most of which I might never have found out about. Or discovered years later, thinking "If only I had known about this back then!" The website has also introduced me to many, many people who enjoy the same things I do. I've taken rides as far away as the East Coast to meet some of these people and I'm helping to plan the fourth National Meet which will facilitate getting people together to meet face-to-face and not just over the computer. It's also a nice excuse to ride for a few days. SR! Is it different being a girl touring on a motorcycle as opposed to being a guy? CF I don't know; I'm not a guy. Ok, just kidding with you there. But seriously, I don't know what it's like for a guy to tour as compared to what I experience. I probably get more attention from non-riders and I've had many a woman tell me how brave I am and how much they admire me. I doubt that they'd say that to a guy riding by himself. I honestly don't think that there are any fundamental differences between the sexes when on a motorcycle. You still have the same chance of accidents, mechanical failures and weirdos at the gas station. Although a caveat to that is that it's probably a lot easier for me to get someone to help me, like the policemen did in Mexico when I was lost. SR! 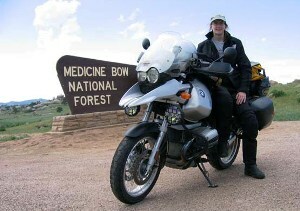 You own a Kawasaki KLR650 and a BMW R1150GS. What purpose does each bike serve for you? The GS is almost a garage queen. It doesn't commute in the city traffic or go out into the gnarly single track of the local ORV parks. But where it shines is when it takes me in extreme comfort and style on long rides. It keeps me warm and holds all of my gear. It has a smooth engine that eats up the miles whether they are paved or dirt. Mountain passes are a breeze and taking the twisted roads through the countryside are fun. And if there's a dirt side road, or the pavement ends, there's no need to miss out on continuing my adventure as would have happened with my VFR. The KLR does everything else. It's my daily "combat commuter" (I have an easy 10-mile, in-city commute that I do year 'round). I run errands on it and try to see how creative I can be when it comes time to hauling various things on the back. Trips to the grocery store are fun when I forget that I'm on the bike and have filled the cart (but I've yet to leave anything behind because it wouldn't pack onto the KLR). I've also started riding off-road much more actively this year and intend to take the KLR into the mountains for some exploration and camping. I'm more comfortable with the lighter weight of the KLR in that environment, seeing as I don't know what kind of trails I'll be on. So while both bikes appear to overlap, there are enough differences that make one better at certain things than the other. And until someone tells me I can't have both, I'm going to keep them. SR! What's on your wish list? CF A tire that never wears and a tank that never empties. If the question was of a material nature, then the answer would be "I don't know." I have the bikes I want, I'm happy with my gear and my GS is fully kitted out with great bags. Perhaps a GPS unit with more memory for maps would fit nicely into the Christmas stocking. SR! What are your preferred guides to use when planning a trip into Canada or Latin America? CF The only guide that I've used and can recommend is The Milepost. It is an amazingly informative and up-to-date magazine that covers British Columbia, Yukon and Alaska. It is put out once a year so all information can be counted on as being as accurate as possible. For instance, I was checking on gas availability for the stretch of road from Fairbanks, Alaska to Prudhoe Bay. It listed Coldfoot and Prudhoe Bay, but nothing else. That was fine as I was carrying extra fuel, but I was surprised when there was a pump open at the Yukon River (well before Coldfoot). I thought that The Milepost had omitted this information but when I double-checked the book I saw that it had actually specified that this stop is not always open and should not be counted upon as a source for fuel. SR! What was your worst day on the road like? CF I had to think pretty hard on this one, but I'd have to say that it was a 680+ mile day riding from mid-Ohio to Madison, Wisconsin. The ride itself wasn't too bad, although I was trying to make time and kept it to the interstates. The problem was that I was so tired; it was all I could do to keep my eyes open. The weather was hot, humid and I was on the road for 13 hours. I stopped a couple of times at rest stops, hoping that if I could just close my eyes for 15 minutes everything would be ok. It wasn't. No matter the weather, the length of time in the saddle, the road or traffic conditions � I never was so miserable on a bike as I was that day. SR! What was your best day on the road like? CF This is another tough one. I enjoy all of my riding, just to varying degrees. But one of my fondest memories of a ride is during the Alaska trip. It was on the stretch of road from Stewart to Whitehorse on the Stewart-Cassiar Highway. The day was overcast and cool and the road surface was broken up by periodic construction, all of which should have added up to an "ok" sort of day. But the remoteness, the beauty, the ruggedness�and the idea that I was riding north into completely new and uncharted territory; it all added up to leave a lasting impression in my mind of complete happiness and joy.